Cook the long beans in boiling water until tender crisp, about 2 minutes. Heat an oil wok or skillet over medium high heat. Add the green beans and stir fry for 2 minutes. 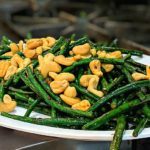 Garnish with roasted cashews. Dish & serve immediately with hot steaming rice.